He wrote the script in Brian McGleenon’s L.T’s Theory Of Pets Dollar Baby Film. 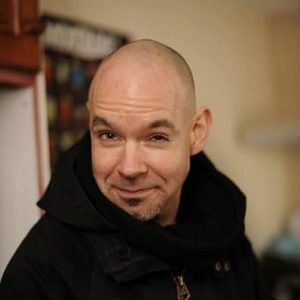 Neville Steenson: I am a Producer, Screenwriter and Actor from Northern Ireland. I have been working in the film industry for over 15 years and my short films have been screened all around the world from New York to London and on TV in the UK and Europe. share the screen with Eileen Dietz (The Exorcist) in a film I am also wrote the Screenplay for. Eileen would later go on to win an award for her perfomance in the short film in New York. I have also had 2 Childrens book’s published and are available on Amazon, Beedy Baddy the Amazing Dog-Frog and Chopper and the Haunted Dog Kennel. SKSM: Why L.T.’s theory of pets was cancelled? Is it possible for Stephen King fans to see it in a future? Neville Steenson: We had everything in place and had cut a teaser trailer for the film and had the support of Kickstarter for the project. However we failed to reach our target amount and the project fell through. It was a hard pill to swallow after all the work we did on the film and it was a passion project for both I and the Director Brian McGleenon. The money wasn’t there and we had a set amount we needed as the readers of this story will know there is no cutting corners with animal wranglers and the period setting. Of course we aim to make it in the future and who knows what might happen but we have had to put it aside for now. There is always hope. little bit more about it? Neville Steenson: Yes the casting of Patrick Monahan a very well known and loved Stand up Comedian from the UK was something I pushed for as Screenwriter and Producer. Patrick is mostly known for Comedy but he has so much more to offer. The story in itself is darkly comic so having a straight up serious actor would have taken from the L.T character I believe. Patrick has exactly what I seen in this character while reading and adapting the story He is an everyman and one with must connect to the audience. We also had the Northern Irish actress Joleen O’Hara attached to play his wife Lulu. Another great actress who i had worked with in the past and knew they would play the characters perfectly. Both Actors were ready and passionate about the project and the spin we brought to the original story. SKSM: How did you get involved in this project? Neville Steenson: When I applied for the story through the Dollar Babies scheme I knew I wanted to do the adaptation and to produce the film version. My first port of call was to adapt the Screenplay and to attach a Director. That is where Brian McGleenon came in. He is a Director who’s work I had admired a lot and he was a huge King reader and fan. We spent endless evenings talking about how and where we wanted the project to go. I was involved from start to untimely ending of the project as Producer. SKSM: How come you picked L.T.’s theory of pets to develop into a movie? What is it in the story that you like so much? Neville Steenson: The reason I picked L.T was firstly because it is a fantastic story and gives you a real look into King’s humour and pathos as a story teller. Secondly I picked the story because it was a departure from his more horror themed short stories. When you think of his other non horror adaptations you get films such as Stand By Me, The Shawshank Redemption and The Green Mile to name a few. This is more the avenue I wanted to explore as they are works of great depth. Another reason I picked it was because I could put an interesting slant on the story. Originally the story is is set in the backdrop of an axe murderer and the cloud of paranoia. What I did was take it from America and set it in the backdrop of the 1970’s England during the backdrop of the Yorkshire Ripper which was a horrid time for people living it. Then I took that and had L.T narrate the story as an old man. This was interesting to me as it deals with a love lost and the uncertain outcome of a now estranged marriage. I found it fit very well with the tone the undercurrents of the original story. On a personal note I still think it’s the best work I have done as a Screenwriter. SKSM: Did you know that this story is not yet adapted as Dollar Baby Film? Neville Steenson: No I was not aware of this when I first optioned it but I learned it not long after. This is a shame really as it is a very different kind of story and one that would make for a fantastic film. However I have learned first hand that it has to be done right. It needs a proper budget and there would be no corners cut or it would suffer. Neville Steenson: I am a massive Stephen King fan and have an extensive libary of his work. No other story teller has had such a profound effect on me and inspired me to pick up a pen as he has. Wow where can I start picking my favourite works by the Master. Book wise I Love his book IT and the Stand and his more recent little book Joyland was a fantastic piece. As a writer he has changed with the times and his work has matured but the one thing that has never changed is his ability to connect with his reader. The Constant Reader if you will. One thing is certain when you pick up one of his books it will grab you and hold you right through to the final word and beyond. Film wise for me Stand By Me has a special place as my favourite King adaptation, Misery also has to feature and the original Salem’s Lot. That would be my personal favourites. Neville Steenson: I was aware he did this through reading an interview with him and then a filmmaking friend posted about it saying the scheme was open and so I applied and got the rights. Neville Steenson: Post L.T I have been very busy on a number of feature film projects. One is an Asian Horror which is being developed through NI Screen (Game of Thrones, High Rise) and is a horror about a young woman who must fight to save her unborn child from a dark Cult. The other feature film I am working on is another adaptation (I will never learn!) this one is a Jane Austen film anda period piece and we have attracted some major talent and interested but I can not really talk about it at the moment due to the nature of the productions development. Both projects and very different but are great fun to be Producing. Neville Steenson: I would just like to say to your readers a big thank you for taking the time to read this and hope I have not put you to sleep reading it. I really want to add it is fantastic for such a great forum about King and his work is out there. Keep up the great work and I would love to hear from you guys so check me out on Twitter. Thank you again for the oportunity.